NEW PHOTOS 8-2-09, now all in proper sequence of the trip.. We made up in sunshine in '09 from last year's clouds/rain. We had full sun 8 of the 9 days in Alaska, and the locals were constantly reminding us of our good fortune. A lot of these photos were made from moving vehicles where control over composition was limited, but the scenery and lighting were both good enough most of the time to make up for the other missed opportunities. The captions and facts come from info given directly to us by guides, personal observations, or from published sources. The ship was luxurious, as the photos on the last page will attest. The Elk were part of a dozen that blocked the Slate Creek Road to Mount Rainier. 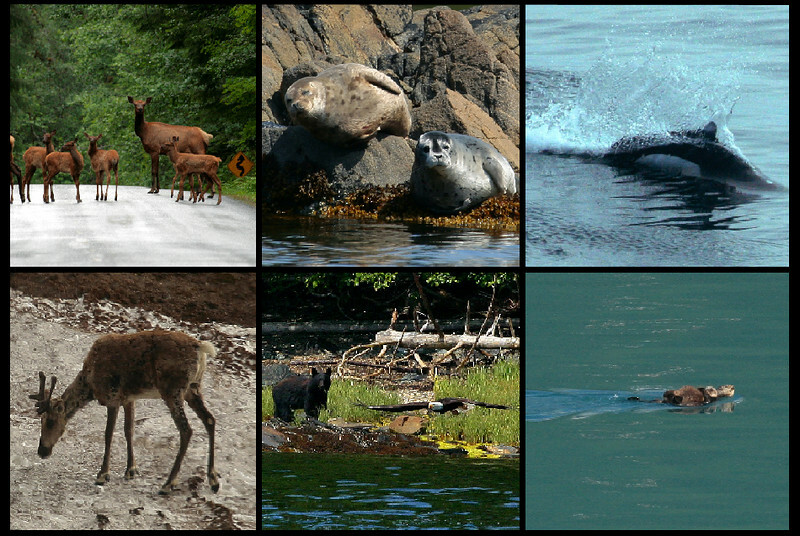 The Harbor Seals were some of a large group seen on the Ketchikan water wildlife tour. The Dolphin was very fast and had no trouble blowing by our ship at full cruise with dragster-like acceleration. A Caribou is next, standing in a shallow snow field (Denali Park). The Eagle came from nowhere in a total surprise as he cut in front of the Black Bear photo session to pluck a fish from the water. My favorite on this page is the Sea Otter and its fully visible youngster. Look close and you will see the round face of the mother's pup, lovingly carried face up on Mom's belly.